There are a lot of serious issues that we are confronted with in our lives. We have the stress of bringing home a weekly pay check to support our families, raising kids in a society where moral values are changing, aging parents to look after, health concerns that eventually invade all our lives, and the list goes on. Every time we turn the TV on it is filled with bad news that only adds to our accumulating aggravation. To temporarily escape it all we take week long vacations, take short mini-trips and engage in activities that momentarily remove us from the often overwhelming stresses that the living of life can bring our way. Is there any way we can enjoy the sunshine of an “instant vacation” in the normal routine of life while still being involved in the daily activities that life brings our way? Yes there is. Milton Berle said, “Laughter is an instant vacation.” Laughter is a heavenly gift that we often overlook, take for granted, and even sometimes ignore. In dealing with life, a good sense of humor is a must. We find written in the wisdom of Proverbs, “A merry heart makes a cheerful countenance: but by sorrow of the heart the spirit is broken (Proverbs 15:13), and “A merry heart does good like a medicine: but a broken spirit dries the bones” (Proverbs 17:22). Solomon tells us in Ecclesiastes that there is “a time to laugh” (Ecc. 3:4). The Inspired Word records that He that sits in the heavens “laughs” (Ps. 2:4). When His blessings fill our coffers the Psalmist says it should fill our mouth with laughter (Ps. 126:2). There are over forty references to laughter found in the Bible. When was the last time you laughed? Did you ever laugh that it did not make you smile and make you feel better? Laughter is like beautiful music as it drifts through the air bringing smiles to faces. Laughter has been called “internal jogging.” Researchers agree with King Solomon that laughter is good for the soul and body, as it is a natural stress reliever and has positive effects on the human body. Laughter improves blood circulation, increases the heart rate, lowers blood pressure, boosts the immune system, and releases endorphins and other hormones that makes one feel better. From four decades in the ministry I know if it was not for a good sense of humor and the magic of laughter I would have probably jumped off a bridge a long time ago!! When I have the privilege to deliver the charge to a young preacher entering the ministry one of my points of advice to them is to make sure they keep a sense of humor and learn to laugh…laugh a lot. While we need to be serious about the living of life we don’t have to be somber while we do it. The great British preacher Charles Spurgeon was once approached by someone who scolded him for what they considered his excessive humor. Spurgeon’s reply was, “If you knew how much I held back you would really be proud of me!” The renowned preacher knew that a healthy sense of humor kept him sane amid the grimness that life sometimes brings our way. Last year when I was dealing with prostate cancer, I strived to keep my sense of humor through it all. While it was a serious situation, and still is, I refused to be somber about it. On my first day of radiation treatments as I lay on my back on a table with my dignity abandoned and myself exposed before two ladies I didn’t even know, I quipped to them, “Pleases do me a favor; don’t put these pictures on Facebook!” They laughed and promised they would not. That set the tone for the 43 radiation treatments I had to undergo. When I finished my treatments, those same ladies told me thank you for coming everyday with a cheerful smile and spirit. If they only knew that there were days I didn’t feel that way, but I knew it was essential to act that way. The music of laughter allowed me to dance through a difficult time instead of grimly dragging through it. Laughter is truly a gift from God, it is natural and innate. Babies begin smiling a few weeks after birth and begin laughing within a few months. Can you think of anything more melodious than the laughter of a child? It is contagious. Each time we hear a child laugh we are reminded that as we grow older not to lose this precious gift the Lord has given us. If laughter is good for us, then let us not deprive ourselves of this marvelous medicine. Let us not neglect to take time to laugh. 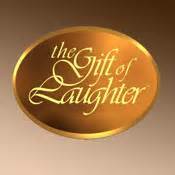 While it may be difficult to laugh when events are not going well, it is in those very moments that the gift of laughter may get us sanely through the rough spot and help us handle the stress. Even amid the dark clouds of life let us not fail to see the sunshine peaking through the clouds. It is often a little lighthearted laughter that helps us see those bright sun rays. Laughter is the medicine that gives to our lives that balance in body, soul and mind, which helps us face the turbulence of day to day living. Laughter is the icing on the cake of life. Let us not only enjoy partaking of an icing-laden slice of that cake but let us share a slice with others.